Bowie’s early costumes for Ziggy Stardust were inspired by Milena Canonero’s costumes for Stanley Kubrick’s film A Clockwork Orange, which he saw on its release in 1971. This take subverts the original pristine white jumpsuits worn by the “droogs,” the violent teenage hoodlums in the film. 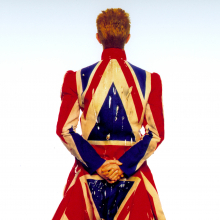 Bowie described this costume as “ultra-violence in Liberty fabrics”—a prominent fabric purveyor known for elaborate patterns. 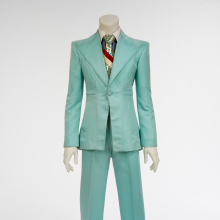 Though it looks more turquoise in person, this suit appears “ice blue” on film due to the particular film stock and processing used by director Mick Rock. The eye-popping colors of the ensemble were matched by Japanese eye shadows applied by makeup artist Pierre La Roche. “For weeks my stage persona went all geisha,” Bowie said. The colors stood out vividly in a white studio. 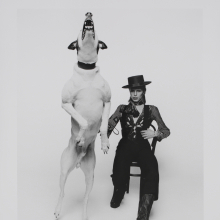 Terry O’Neill took a set of photographs as reference images for Guy Peellaert’s cover artwork for the Diamond Dogs album. A powerful image from the session was also used to promote the album. The central character of the book splayed at Bowie's feet, The Immortal (1958), is inspired by James Dean. Bowie’s Diamond Dogs tour took rock theater to a new height. 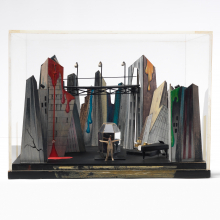 Design inspirations included the Expressionist films The Cabinet of Dr. Caligari (Robert Wiene, 1920) and Metropolis (Fritz Lang, 1927), as well as George Grosz’s caricatures of a corrupt 1920s Berlin. The elaborate set, which evoked a decaying urban world, cost around $250,000 and took thirty-five people a day to construct at each venue. Bowie here faces away from the camera, in contrast to all his other album covers. However, his red, spiked Ziggyesque haircut is immediately recognizable. He wears the Union Jack coat he co-designed with Alexander McQueen. The photographer Frank Ockenfels, a technology enthusiast like Bowie, designed the image to be superimposed onto a vivid green English landscape. Organized with unprecedented access to David Bowie’s personal archive, this exhibition explores the creative process of an artist whose sustained reinventions, innovative collaborations, and bold characterizations revolutionized the way we see music, inspiring people to shape their own identities while challenging social traditions. David Bowie is has been touring globally for the past five years and is taking its final bow at the Brooklyn Museum, providing an opportunity to view this one-of-a-kind material. 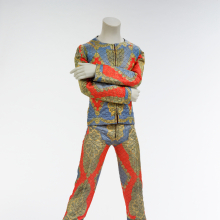 Highlights of the exhibition include more than 60 custom-made performance costumes, including six designed by Freddie Burretti for Ziggy Stardust / 1980 Floor Show and seven designed by Kansai Yamamoto for Aladdin Sane. 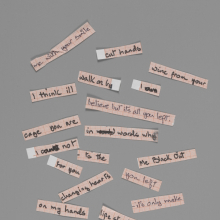 There are 85 handwritten lyric sheets, including those from “Fame” and “Fashion”; drawings, including a sketch for the Young Americans album cover; and oil paintings, including two of musician Iggy Pop, all by Bowie. There are also more than 40 pioneering music videos, television clips, and filmed roles as well as a multimedia presentation of international tour footage with rare scenes from the legendary Diamond Dogs tour, filmed in Philadelphia. 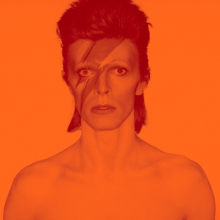 A custom audio mix made up of snippets of Bowie’s songs—produced by longtime collaborator Tony Visconti—is also featured. The exhibition is accompanied by a richly illustrated catalogue edited by Victoria and Albert Museum Theater and Performance curators Victoria Broackes and Geoffrey Marsh, with essays by Camille Paglia, Jon Savage, Howard Goodall, Christopher Breward, Oriole Cullen, Nicholas Coleridge, and a roundtable discussion with Sir Christopher Frayling, Philip Hoare, Mark Kermode, and Geoffrey Marsh.